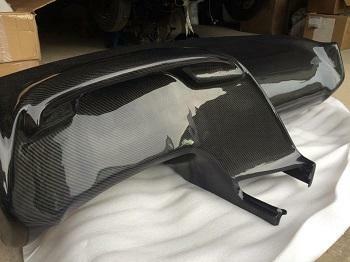 The CP Racing MKIV Supra Carbon Fiber Dash is complete with all OEM contours this is a one piece lay of carbon fiber. The finish is a clear coat that is buffed to a shine. Meant to be a light weight option or as a replacement to your old worn out OEM dash. This is an awesome piece to see in person and weighs in at 8 lbs. Formed to fit the OEM center console. Requires minimal mounting bracketry. Ships via truck freight. Made to order, general turn time is 2-3 weeks. Shipping cost will show $0 when you check out. We will contact you with exact shipping cost before we process your order. In the 48 states, the average shipping cost is $200.